I’ve been a fan of RTS for as long as I can remember, having played WarCraft: Orcs and Humans shortly after its release up to and including modern, just-released RTS like Act of Aggression and in-progress games like Servo. It’s no surprise to readers of this site, but real-time strategy games are my passion, and over the years of playing and writing about the genre, I’ve developed some fairly strong opinions and preferences about RTS design. This has led me to want to put my money where my mouth is, and actually flesh out some of my ideas and theories and actually make games that exemplify some of them. Maps whose tactically important areas shift over time due to player actions. For some additional information, please read my initial post on the topic. Now, I’d like to take the time to introduce you to the units of the Constructors faction, as well as some of this faction’s unique mechanics. Where applicable, I will mention designs that are not yet finalized, which are more likely to change (though please note that none of this is currently set in stone). The Constructors faction is centered around a single unit: unsurprisingly, it’s called the Constructor. Part MCV from Command and Conquer, part Commander from Supreme Commander, the Constructor is the beating heart of its faction. The Constructor is the primary builder of all units and structures, and also serves as the primary drop-off point for resources harvested by other units. It is also able to become a potent weapons platform, configurable with a variety of different primary and secondary weapons systems and a variety of passive bonuses and features, ranging from personal shields to stealth to skill-shot area damage effects. Many of these bonuses and weapons systems are mutually exclusive, and purchasing one will overwrite another option, or will invalidate other options being chosen. Additionally, the player cannot build additional Constructors, and should they lose it they will lose the game. For anyone interested or concerned with my repeated use of the ‘Crawler’ from Command and Conquer 4 as a visual representation of the Constructor, it is a very close analogue in some respects. 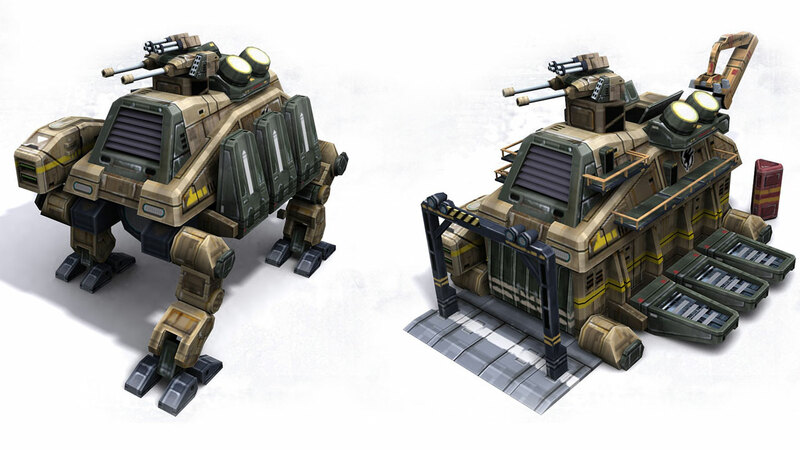 In both cases, these units produce virtually everything their faction needs: however, the Constructor will not respawn when killed, has Energy to limit what it can do at any given time, has more upgrades that change what it can do, also builds structures not directly related to attacking or defending (e.g. more than just turrets) and also begins a match with the ability to attack. Additionally, the Constructor can continue to move as it builds units, which I hope to be more interesting than the Crawler, which was honestly more fun when mobile. The differences, as I hope you will see, are more substantive than incidental. My Constructor system has consequences. Also, I have not entirely eschewed base building, as C&C4 did. The Constructor is the primary beneficiary of upgrades for its faction, with a number of structures that support mutually exclusive upgrade options. That is, getting some upgrades precludes getting other upgrades – if you choose upgrade A, upgrade B will become unavailable, etc. Using the Constructor is intended to be non-trivial: everything it does is an opportunity cost. Building a structure means it is not on the front-lines supporting combat, and not in an optimal position to serve for short harvester queues. Staying near harvesters protects them, but also means that units it produces will have to slug it a long way to get to the front lines, and so forth. The Constructor currently uses a 2x scaled Immortal model, as it is the closest approximation with 4 legs I could find. If any unit in this mod would get a custom model, it would be this one. I may experiment with giving it a different Turret, though I have not yet done so at this point. The Constructors have 4 tier-1 units, all produced by the Constructor itself: the Scrapper, the Junkslinger, the Lookout and the Ram. The Scrapper is the primary front-line fighter for the faction, having a short range cutting torch it applies both to resources and to enemy armor. 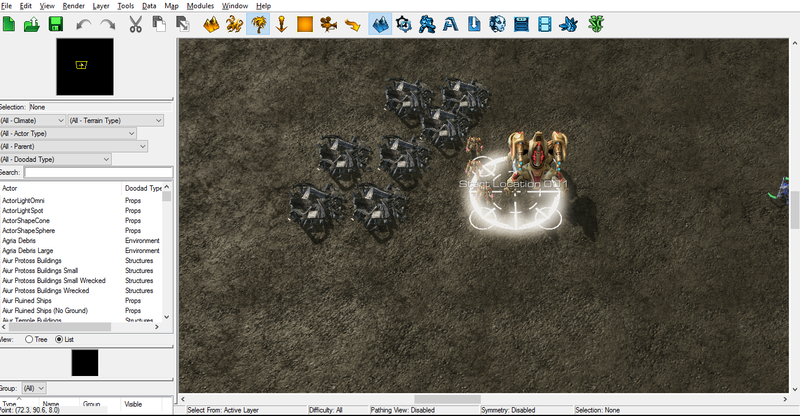 Its attacks are Heat-based, which means they completely ignore all armor save Scrap-class armor (I will touch on this in another article, but in short: Scrap, unlike Minerals in StarCraft 2, can be attacked and while most attacks do very little damage to Scrap fields, some attacks are designed to destroy Scrap, allowing players to literally attack the resources of their enemy), and it can take quite a licking. Scrappers are also the primary harvester for the Constructors, bringing scrap metal to be smelted and re-processed by their builder and master. Scrappers are one of the most consistent units in the game, with good damage and HP for their cost. However, they are one of the shortest-range units in the game and have a fairly slow acceleration though decent top speed, so they are able to be kited, and each one killed decreases the Constructors’ mining power. Additionally, the more Scrappers that are committed to combat, the fewer Scrappers will be bringing in additional resources, causing potential force replenishment issues for Constructor armies in the long run. The Junkslinger is the primary ranged damage dealer for the Constructors. They are much more fragile than the Scrapper, and designed to be screened by a wall of tougher units. They have decent range and can attack air, Their primary utility lies in their Scrap Cannon, however: a long ranged AOE ability that costs Energy and resources. In a scarce resource RTS, each use of the Scrap Cannon is a huge opportunity cost: the resources involved in multiple uses of the Scrap Cannon could be used for repairs, a new structure, even more Junkslingers or higher tier units. However, due to the prolific nature of Dendrites armies, area damage will be essential to Constructors forces and therefore occasionally worthwhile. Junkslingers have Energy, and when it is depleted their range and attack rate are decreased. Normal attacks cost 10% of their energy, while Scrap Cannon costs 50% of their energy. The Junkslinger currently uses the Stalker model, though this is subject to change. The Junkslinger does not work much like the Stalker, however, being slower and more fragile. 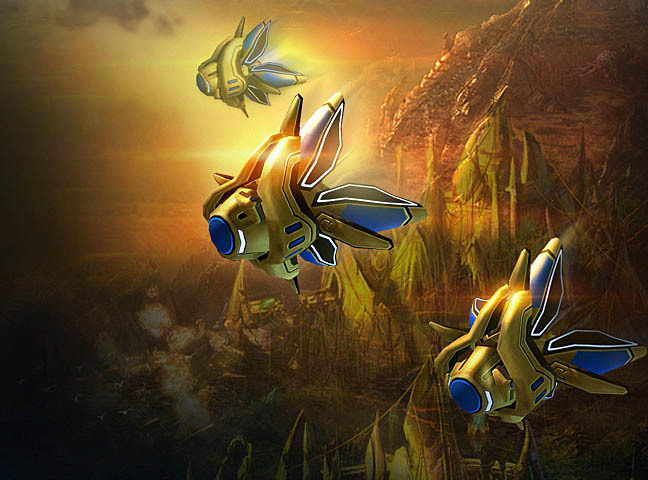 The Lookout is a flying, unarmed scout, much like the Protoss Observer. However, unlike the Observer, the Lookout is not invisible and is therefore more vulnerable to anti-air fire. However, the Lookout has an additional, tactical use. Once they stop moving, they project a field around themselves that interrupts spellcasting. No enemy unit within the range of this field can activate any ability which costs Energy due to the Lookout’s interference effect. This also effects units with passive or on-attack abilities, which would in many cases decrease unit effectiveness. Also, the interference effect grows with time, having 3 possible ranges depending on how long the Lookout’s remained motionless. The Lookout currently uses the Observer model. The Ram is the primary damage soak for the Constructors faction, a stalwart bulkwark putting itself in harm’s way for the Constructor. The Ram has high hit points for its cost, though low damage per second for its cost, thanks to a relatively slow fire rate. However, it has an additional, passive effect: its attacks have a slowing effect with a small splash range. This is intended to encourage players to target Ram attacks carefully, to effect a larger portion of their opponent’s army, as well as encourage those playing against Constructors forces to split and attack from multiple angles. Additionally, the Ram’s attack deals no damage to units with Electric-class armor, though its slow effect still applies. Rams have relatively short range, as well. The Ram currently uses the Siege Tank model, though slightly scaled down. The Constructor and its basic forces make a formidable, cohesive fighting force, and this has been done with reason. I wanted it to be entirely possible for the player to focus on a large army of Tier 1 units without having to resort to Tier 2 units if they wanted to forgo them. Tier 2 units are intended to provide additional utility over Tier 1 units, but stat wise will be less efficient at cost in most cases: my intent is to have players constantly balancing the number of Tier 1 units, Tier 2 units and Constructor upgrades they use. You may note that Constructors Tier 1 units are short ranged: again, this is with reason. The Constructor itself will have several available long range attack options, and will have a fairly high damage basic attack. Thus, the Constructor will be an important early game source of area damage, anti-air support and consistent ranged damage. In future articles, I will go over the Constructor’s tech tree in more depth, covering Tier 2 and 3 units, all of which are upgraded from Tier 1 units. So, you would build a Tier 1 unit and then, when the requirements are met, would upgrade that unit into one of its Tier 2 upgrade options. Some units have been deemed too powerful to be Tier 2, and have been locked behind an additional structure requirement, and are therefore considered Tier 2.5 or Tier 3.